The veil is often used in Western media as a sign of the oppression of Middle Eastern women, and their need to be saved or liberated by Westerners. In Persepolis, Marjane Satrapi actively refutes this representation by presenting veiled women as agents of resistance, and as embodied, fully complex characters who are skeptical of Westernization as a path to liberation. Because the images that Satrapi is refuting are so pervasive in Western media, it is important to note that there are other real-life cultural examples that are similarly innovative and even similarly hybrid. One such example is the work of French street artist Princess Hijab. In France, of course, the veil is a particularly potent political signifier. In France, the niqab has been banned in public spaces because the government claims that a ban “protect[s] women’s rights and stop[s] them from being forced by men to cover their faces” (Chrisafis). Princess Hijab’s artwork is deeply ambiguous, but it is perhaps this ambiguity that most clearly invites an association with the complex, hybrid representations of veiled women presented in Marjane Satrapi’s Persepolis. Princess Hijab’s own identity remains elusive; she has recently confirmed she is not Muslim, but indicates she may be associated with some minority, and even her gender remains mysterious, as she has appeared for interviews only in androgynous clothing (Aburawa). 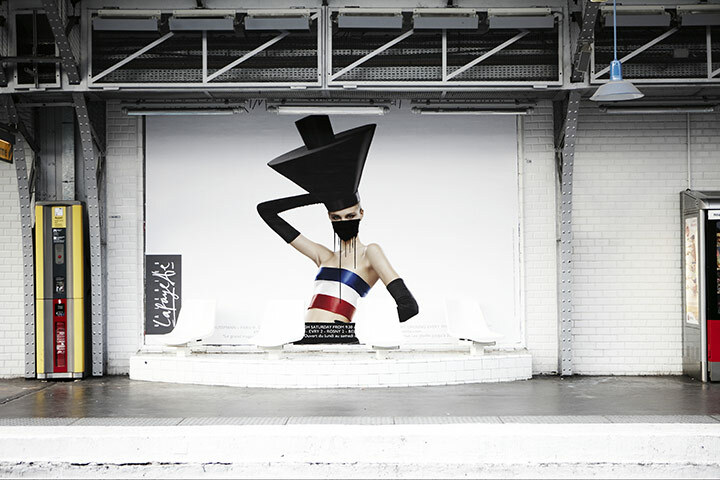 Princess Hijab began graffiting Parisian billboards in 2006. Using a black marker, she inscribes hijabs on the bodies of women, men and children in fashion advertisements, often leaving large amounts of skin still exposed. These contradictions in her work—removing the hijab from its particularly gendered context, as well as its association with a singularly oppressive, concealing function—is perhaps what makes it most interesting, but has also led to the work being interpreted in a variety of ways, some claiming her as pro-feminist, some as anti-feminist; some claiming her as pro-Islamic, some as anti-Islamic. These seeming contradictions and complexities are perhaps part of the larger statement of her work; by resisting the easy binary categories that Western culture asks her work to fit into, she draws attention to the boundaries between them. From a postcolonial feminist perspective, her work can be read as expressing the hypocrisies of exporting Western feminism, or Western attitudes in general, to non-Western cultures, by emphasizing the way that these sexualized, objectified bodies are exploited as part of advertising. Blogger Ethar El-Katatney sees Princess Hijab’s work as perhaps a feminist statement: “Fed up with women being used to sell products, hijabising ads could be a way to ‘take back’ women’s rights to their bodies.” Because she uses the hijab on both men and women, I would argue that the same commentary is being presented across genders. Princess Hijab herself sees her work as “reassert[ing] a ‘physical and mental integrity’” to the human body that has been subjected to “the ‘visual terrorism’ of advertising” (Aburawa). Princess Hijab’s work also resonates strongly with postcolonial feminism because the resulting images of her “hijabized” advertisements combine the Eastern with the Western in a startling way. The images seem to call attention to the binaries that are used to justify Western “liberation” and Eastern “oppression,” expressed by the sexualized bodies of Western advertising and the Islamic veil, and also suggest the damaging effects of advertising images. Also, by placing the burqa in a new context, outside of its usual representations as part of a Western representation of an oppressed Muslim woman, Princess Hijab perhaps calls attention to the importance of this context in understanding the “meaning” of a veil in a particular instance. It is hard to arrive at a conclusive, comprehensive reading of the work of Princess Hijab, especially as details about her own identity continue to emerge, however her strategy of using the hijab outside of its usual context in the West aligns her work with Marjane Satrapi’s Persepolis in its resistance to the dominant Western stereotypes of the Middle Eastern woman and the veil.